Not to be overlooked are some simple bicycle solutions which allow ladies to carry a wider range of bags. In fact, many commuter and road bicycles are integrating the upright position for comfort. You won’t be able to draft with Lance Armstrong but you will be able to carry a cross-body bag more easily. 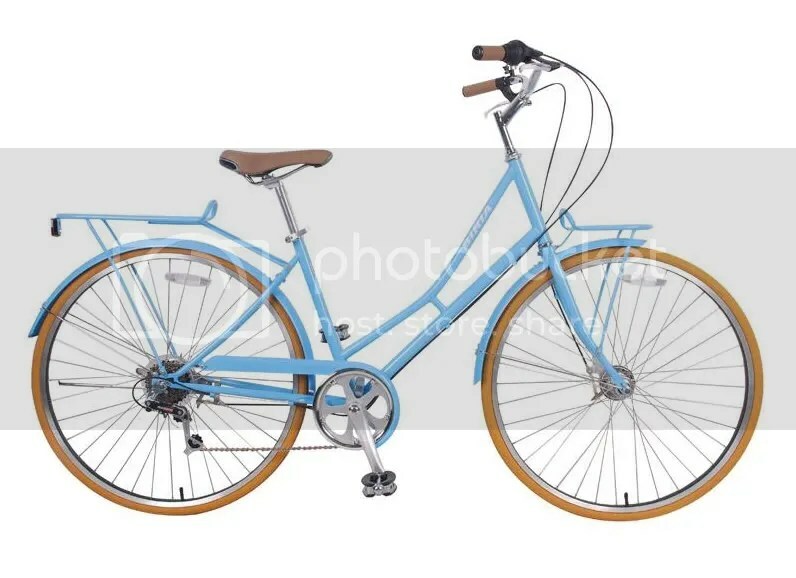 Whenever looking for a commute-friendly bicycle, features like chain guards (won’t snag a skirt), fenders (keeps dirt/mud from getting on clothes), and a bell (hey! close that car door) can be very helpful. Be aware that a fully enclosed chain guard or drive train requires a screwdriver if the chain jumps the gears, unlike a half-enclosed version, a lesson learned the hard way on my cruiser. A bicycle rack (fits above the rear wheel) or a basket (in front of the handlebars or on top of the rack) are other handy ways for carrying bags/purses. They will also save your back and shoulders. It may require some measuring or a trip to the bicycle shop to find a rack that fits the bicycle as they are not one size fits all. A satchel or purse can be tied down or hung on the rack in some cases with a cute, vintage scarf. Just make sure that the purse and scarf do not get caught in the wheel and that they are very secure. If someone is just sitting around waiting for a million dollar idea to fall in their lap – look no further. I could only find one decent looking (non-leather) one online, by Alexis Hudson, and it is $225. Practical and potentially fashionable, a convertible backpack would be the ultimate solution if you can find one for a reasonable price. Backpacks are comfortable and functional for cyclists but they don’t translate well for a dressier night scene. Urban Outfitters is a good place to look for nylon and canvas backpacks. Fred Flare currently has a recycled canvas backpack for $32. The design is simple and there are several colors. With a little thread, buttons, paint or an iron-on design it would make a great canvas for your creativity. There are lots of medium-sized cross-body bags and many have removable shoulder straps. Wider shoulder straps are preferred. Unfortunately many stylish ones are leather and apparently out of stock! 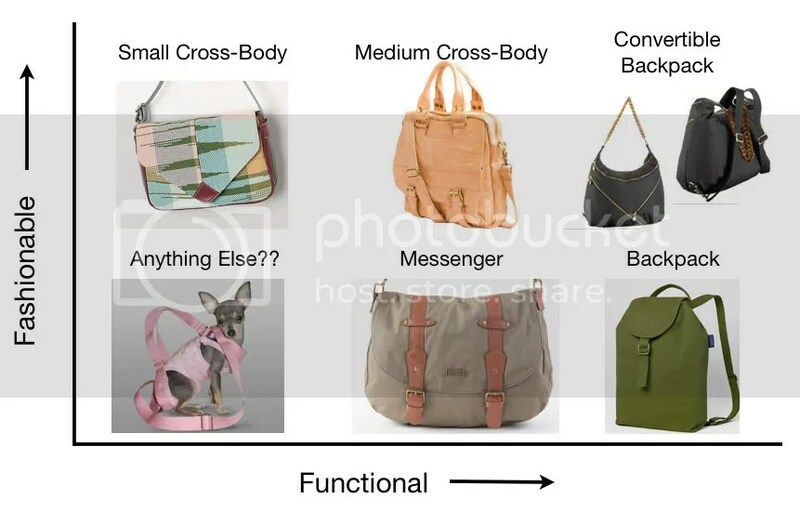 Messenger Bags are a style of medium cross-body bags. They typically feature two buckles which close a top flap and are large enough to carry whatever it is that bicycle messengers carry. Luckily they are usually made from a breathable fabric like canvas. Totally impractical and yet adorable. Cross-body clutches won’t allow you to drag paperwork to the office but they will fit into a backpack to be removed for happy hour. Cross-body clutches are also nice because you can dance hands free without leaving your bag unattended or on a sticky dance floor.